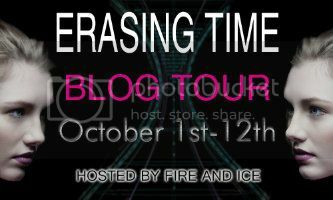 I'm very excited to be one of the stops on the blog tour for Erasing Time! Combining science fiction, dystopian, and romance genres, Erasing Time is a book that is hard to put down and left me wanting to know what happens next. I'm very excited to have C.J. Hill here today. She was kind enough to answer questions about Erasing Time and some of her favorite things. Please take a few minutes to learn more about this author! If this were Twitter, how would you pitch Erasing Time in 140 characters or less? 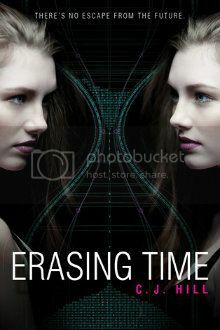 Erasing Time is a time travel, dystopian romance with twists, turns, and a fun take on the English language. There are no vampires anywhere to be found. Erasing Time involves time travel, futuristic machines, and enough science to be believable without being confusing. What kind of research did you have to do while writing this book? One of the twins in the book, Taylor, is a physics genius who not only explains some of the physics behind the time machine, but also comments on some of the difficulties in building one. I’m not a physics genius, so this took some research on my part. Luckily while I was writing the book, Discover Magazine did an issue devoted to physics mysteries. It came in handy. Also, I’m married to a rocket scientist. He came in handy too. In your book, the language has evolved in the future. How did you develop this new English? I’ve always found the progression of the English language interesting. Take the word ‘sincere’. It literally means without wax. Back several centuries ago when artisans were paid to sculpt statues, they sometimes made mistakes and filled them in with wax. The mistakes were indistinguishable from the marble for a long time, but eventually became apparent. By then though, the money paid to the artisans was long gone. So the word sincere—without wax—came to mean something that was genuine. See what a word geek I am? When I first wrote scenes from Echo’s point of view, I threw in lots of phrases and words to make the future dialogue sound different from 21st English. Most of those got taken out. My editor thought they would make the reader stop too many times to figure out what Echo meant. She’s probably right. Now there are just a few words and phrases to give the dialogue a futuristic feel. One of the hardest things about the novel was keeping 21st century slang and words out of the 25th century characters’ dialogue and thoughts. At first I never had them say the word ‘well’. I figured it would be gone after 400 years. The absence of ‘well’ made the characters’ dialogue seem stilted though, so I had to put ‘well’ back in. Sometimes you’ve got to sacrifice accuracy for readability. From where do you draw your inspiration as a writer? Who are some of your favorite authors? Growing up, my favorite author was Ellen Conford. Her writing wasn’t full of poetry, descriptive passages, theme or symbolism. It was light, funny, and easy to read. I think she really affected my writing style because I write a lot like she did. If time travel were possible, when/where would you want to go? I’d go back and tell teenage me to wear the sunscreen like my parents kept telling me to put on. I’d also insist that teenage me always wore my seatbelt. In fact, I’d pretty much take White-out to my teenage years. The Phantom Tollbooth. It was perhaps the only book I read more than once when I was a child. I loved it so much that I’ve written a Phantom Tollbooth-ish (Another made up word. Maybe one day I’ll catch up to Shakespeare) novel of my own. I’m waiting for a revision letter for it right now. It was a fun book to write because I got to do a lot of word play things. That’s how I try to live life. That’s also why I don’t watch a lot of sports on TV. I don’t care who wins. The sequel to Erasing Time, Echo in Time has gone to the copy editor, so it’s about done. I still have revisions to do on the Slayers sequel and my middle grade fantasy (the Phantom Tollbooth-ish book.) I’m also plotting out my next fairy godmother book. Lots is going on. I am very excited to offer one copy of Erasing Time for a giveaway, courtesy of the author and Harper Teen. To enter, please fill out the form below. This contest will close on Sunday, Oct. 21 at 12:01am CST. Don't miss any of the stops on the blog tour! I love it when an author has the draft of the sequel complete before the prequel is released! It means we don't have to wait a year for the sequel to come out and bite our nails in anticipation! This was an awesome interview and thank you for giving us the opportunity to win a copy! I love books about time travel! I think its hilarious you'd travel back to your teenage self and basically reprimand yourself. Even though it was only 4 years ago I was a teenager, I think I'd have to yell at myself for a lot of the same things! This book looks so fascinating. I would also like to take some white out to my teenage self. I think it is so interesting to hear how C.J. Hill came up with the language for the book! Can't wait to read it whether I win this or not!! Loved this book. I would've enjoyed the parts from Echo's speech. Editors don't know anything. HAHA! J/K. This was a great interview. Love to hear "CJ's" thoughts and answers! What fun this blot tour has been! What a great interview! I love her thoughts on words and the evolution of language. Can't wait to read this one! I love all of her books! They're clean, funny and have happy endings. Thanks for blogging the interview! I love CJ/Janette! She always makes me laugh! Who knew sincere started with statues? I am SO excited to read "Erasing Time"!!! The interview is fascinating! I had no idea that sincere meant without wax. It sounds like she spent a lot of time researching words and phrases for the book. I'm really looking forward to reading it! Thank u for this awesome giveaway. The book sounds really interesting. And I enjoyed the interview. Great interview.